to Joy and Adrian´s hand cut coins website. 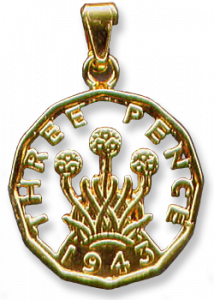 Coin Jewellery: a coin necklace, coin pendant or coin cufflinks made from original coins. Personalised with a birth year for an ideal birthday or anniversary gift. Hand made coin pendant, coin necklace or coin cufflinks with a year of birth. 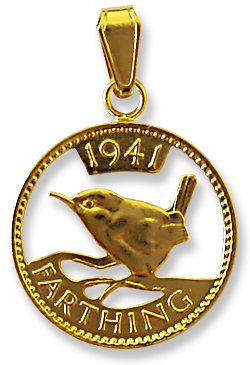 Please browse through the catalogue to see our range of hand cut coin pendants, coin necklaces and coin cufflinks. If you are looking for a birth year coin click the appropriate year range in the catalogue. For example if you are looking for a gift for someone with a birth year of 1958, click 1953-1967. Individually carved to create an unusual present that can be personalised with a year to make an ideal present for a birthday or anniversary. 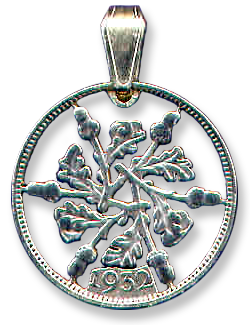 Joy and Adrian are based in Cardiff and have been making cut out coin jewellery since 1989. We start with an original coin and drill small holes into the areas we want to cut away to highlight the design. Each coin can require numerous holes. 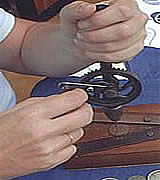 A piercing saw blade is then inserted in to the holes and areas cut away to leave the design suspended within the rim of the coin. 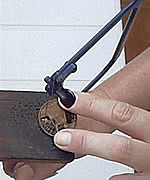 The coin is then soldered with an appropriate attachment to create either pendants, cufflinks, tie tacks or earrings. Finally the coins are either Gold or Silver plated. All work and the finish on the coin is fully guaranteed. For details of the postage and packaging charges please see the information page. We accept credit and debit cards. UK personal cheques are also accepted. Please see the information page for details.